Learn all about DeleD's features and compatibility! Find the sources at SourceForge! In addition to that, DeleD has great support for commonly used fileformats / game engines + we'll add yours if wanted! So whatever pipeline you're using, DeleD fits in perfectly. And as if that isn't enough already, DeleD comes with hundreds of professional textures and prefabricated 3D models. 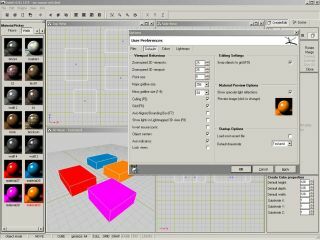 DeleD is easy enough to be used by novice modelers yet also powerful enough to be the choice tool of veteran modelers. 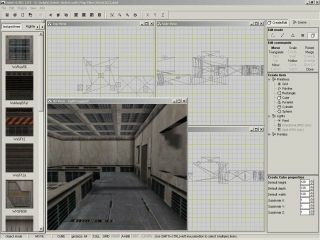 DeleD is a 3D modeler and level-editor combined into one. It focusses at game development and is specifically designed to create static objects/worlds. DeleD unites the functionality needed to create complex 3D scenes with an easy-to-understand userinterface: learn to build worlds within the hour! The concepts behind DeleD are simple. 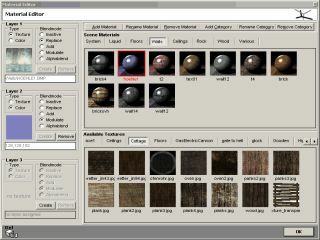 Draw and manipulate textured cubes, spheres, rectangles, grids, cylinders and more. Combine them into new 3D objects and use those to create complete scenes. Then use various types of lights like spotlights, directional lights or pointlights to bring your scene to life. Use these concepts to create your game content fast and easily! The pictures on the left show what you can do with DeleD today. "Ooh, nifty. It�s the only 3d modeller i could work with." "DeleD is the best and easiest level editor I've ever used yet! Keep up the good work." "DeleD just rocks. Powerful yet easy to use - I cannot ask for more." Anything you create with DeleD is license free. This means that you can use whatever you make with DeleD for your own purposes, whether commercially or not. No license fees, no legal strings. Whatever you create with DeleD, is yours to use.